HADLOW DOWN’S VILLAGE HALL: PAST AND THE FUTURE? Hadlow Down’s first village hall, although not named as such, was a large hut obtained from the YMCA and erected on land donated by the Eridge Estate; it was always known as ‘the Hut’ or ‘the Red Triangle Hut’ after its previous owners’ symbol. Opened on June 8th 1921 by Princess Marie Louise, Queen Victoria’s last grandchild, it immediately became the focal point for many of the village’s activities. 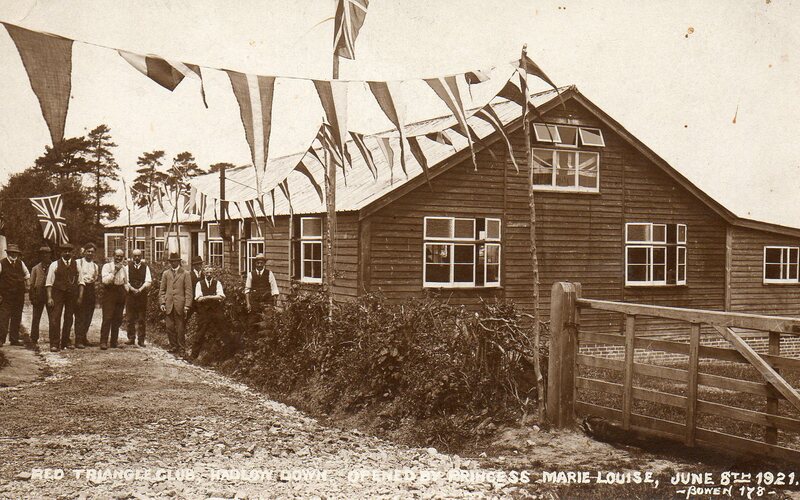 The Hut hosted many social occasions, classes, Horticultural Society meetings, the Organ Club, British Legion (male and female branches) the Happy Circle for older members of the village, the Jazz Club, the Pied Pipers drama group, and the Bowls Club. It was also used for more formal meetings such as the Church Parochial Council and the Parish Council. Before 1921 there had clearly been a necessity for a village meeting place. Until the opening of the school in 1838 there were no community buildings in Hadlow Down. When the school opened, suddenly there was not only somewhere for children to be educated but also a place for villagers to meet and enjoy leisure activities together. In 1909 the Sussex Express reported that a concert to raise funds for the football club had taken place at the school, later another report in the same newspaper stated that the school had been the venue for a large political gathering; then again in 1910, it reviewed ‘a very enjoyable and successful concert’ with a ‘programme of recitation, banjo and mandolin, song, pianoforte and comic song’ in the school. However villagers didn’t just meet in the school, the ‘loft’ above the Preston shop was also a favoured place with a gramophone to jolly things up a bit. Private individuals also opened their houses and gardens for village events. The Lang Huggins family, who owned the Grange, let villagers use it for summer functions and every winter the same family opened their holiday cottage (now Marlowe House Residential Home) as a reading room where billiards, cards and other games were played and where the village’s clubs and societies could meet. Clearly the opening of the Red Triangle Hut was an eagerly anticipated event and judging from the number of occasions it subsequently hosted: parties, social evenings, wedding receptions, the Autumn Festival etc. it was very successful; older people in the village still talk about ‘the Hut’ with a good deal of affection. As it was situated in the centre of the Village with a field behind it for sports, it seems, along with the New Inn at the top of Hut Lane, to have become one the premier meeting places for the community. However by 1965 it was definitely starting to show its age and in July that year it was knocked down and in November of the same year a replacement was opened and became ‘the Village Hall’; it’s still there! Throughout the remainder of the twentieth century and into the twenty-first, the community has continued to come together in the Hall. The types of meetings have changed over the years along with the age-groups participating but then so has the village. The advent of improved transport communications and changing work practices have meant that Hadlow Down, once a village with a predominantly local, rural, working population has become a ‘dormitory village’ consisting mainly of a mixture of the retired middle-classes and busy commuters who work in the large conurbations of South East England; to an exhausted commuter the attraction of an evening in front of the TV has proved more inviting than supporting the local Jazz Club or helping with the Youth Group. However despite the competition of television some of the older clubs and societies have survived: the Variety Club’s amateur dramatic society can still draw crowds of villagers to pantomimes and murder mysteries. Likewise meetings of the Horticultural Society are a regular feature; the Short Mat Bowls Club and the Dog Training Group, both meeting once a week, have also managed to keep going. Lately, with the popular trend for exercise Zumba, Tap Dancing, Latin American Dancing, Boxing and Gentle Exercise for older ladies have all featured in the hall diary; the Hall is once more becoming a busy meeting place for the community. The latest addition to this varied mix of activities has been the TN22 Club for the over sixties which meets once a week for lunch and entertainment. Increased usage has sadly highlighted obvious symptoms of the hall’s advancing age. 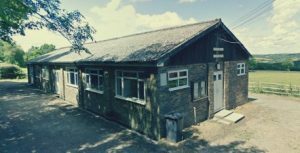 Some years ago it was therefore agreed by the Parish Council and the Village Hall Committee that the current building needed to be replaced, after all it had served the community well for almost fifty years. In 2008 the Parish Council initiated a project to look into provision of a new ‘community centre’ for the village incorporating an attached sports pavilion; the current pavilion was showing the ravages of time also. A number of site options were investigated by the Council and in 2010 a ‘working group’ was formed to consider the way forward. It was charged with investigating possible sites including the current one, what type of building was wanted, size and usage and most importantly whether there was support for the project from the people of the village. This working group has subsequently become the Hadlow Down Community Centre Committee. A public survey of the whole village was organised by the Committee in the autumn of 2011. Villagers were asked to consider carefully if they wanted a community centre, where it should be located and what sort of activities they would like to see there; each household was asked for a response. Over three hundred households were canvassed and approximately two hundred and sixty replied, the vast majority being in favour of constructing a new centre and wanting it to be on the playing field site. 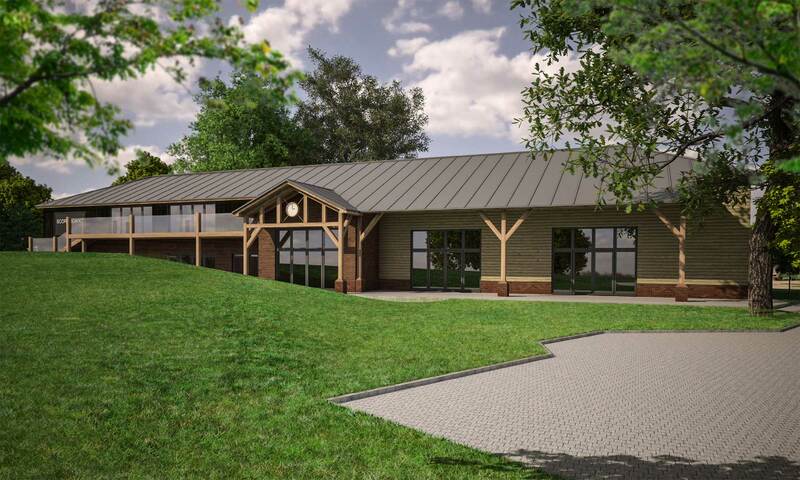 The Committee took this to be a positive response for the new build and recommended to the Parish Council that a new community centre should be constructed on the playing field. Since then the Committee working with the Parish Council has consulted an architect, opened discussion with the local planning authority and sought to clarify the lease on the site of the current hall, which will have to be disposed of to the furnish finance for the new centre: leases on the proposed site are also being renegotiated by the Parish Council. A business plan has been written, a ground survey has taken place and funding is being explored. Given the enormity of the project for this small village, it is acknowledged that it may be some years before it finally reaches fruition but history shows that Hadlow Down has seen the need for a community venue twice before and has been successful in acquiring one – it can do it again! On Monday, 18th Febuary, a Public Meeting in the village hall gave unanimous approval to the plan to purchase a part of one of Curtains Hill Farm Fields and to convert this piece of land into a Village Playing Field and Recreation Ground. The purchase price of this 4 acres of of land is £3,000 and it is estimated that a further £3,300 will be needed to convert the land to a playing field and to provide an access road from School lane and a Car Park. To put the sums of money into perspective, the bank base interest rate in May 1974 was 12%. The average house price was £10,000 compared with £178,000 now (May 1974 – May 2014, whole country, all houses. Source: Nationwide Building Society). The Playing Field has its own website here.